The largest snowstorm to hit Chicago in two years shouldn't deter too many riders from cycling in Chicago. For Chicago's Department of Transportation Commissioner Gabe Klein, any incoveniences that the snow might have had for bicycle commuters are issues that lie squarely on his shoulders. The responsibility for keeping the streets clear of snow has typically fallen under the jurisdiction of the Department of Streets and Sanitation. Now CDOT has assumed the responsibility for plowing the protected bike lanes free of snow. Streets and Sanitation will still salt the roads--including the bike lanes-- but now CDOT will extend its responsiblity beyond just keeping the sidewalks on bridges clear of snow. According to CDOT spokesman Peter Scales, this assumed responsibility for the bike lanes was merely a logical extension of the department's use of smaller-scale equipment already in use for clearing sidewalks. For those not already familiar, a protected bike lane is different in nature from a painted bike lane. A protected bike lane is a lane that has clear demarcations dividing motorist traffic and cyclist traffic through the use of actual physical barriers (a line of plastic pillars). This physical barrier would of course pose a problem to large snow removal trucks, like those used by Streets and Sanitation, since there would simply not be any room for them to navigate their equipment in such a narrow space. 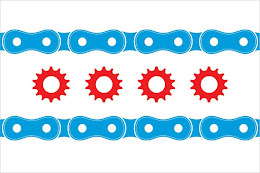 While the number of protected bike lanes is still growing (there are currently 10.5 miles of protected bike lanes out of the promised 100 mile mark), there is the question of how easily CDOT will be able to handle their expanding role as mileage of protected bike lanes throughout Chicago increases. The answer for that remains to be seen.